If you are in the throngs of wedding planning, you might have figured out what type of wedding, unity or commitment ceremony you are going to have. If you are barely engaged, and just started looking at wedding magazines and blogs (like ours, and thanks for stopping by! ), and might have picked out your wedding color palette, have you decided yet what type of ceremony you and your spouse-to-be are going to be having? After all you both have decided to seal the deal, right? But how will you make it legal and permanent? 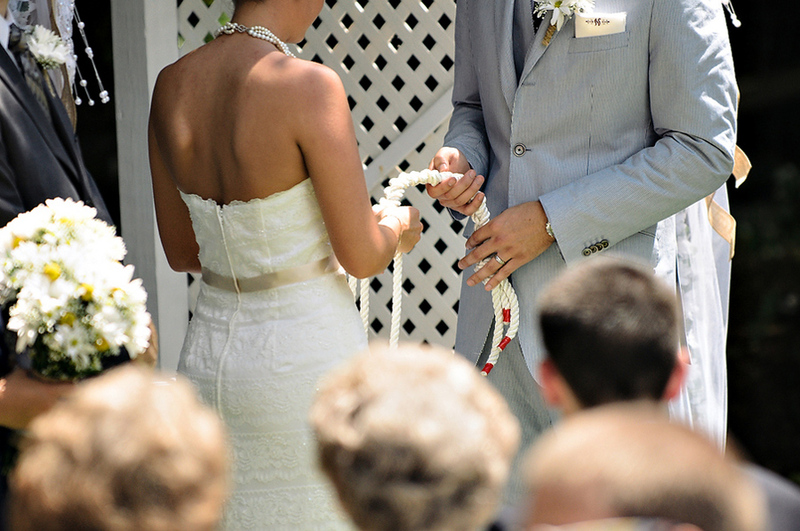 We have gathered 9 different types of ceremonies that we have featured on this blog. We are lucky that we do cater to a wide variety of readers, and as such we have many varied real wedding submissions to help inspire those in the wedding planning process. A traditional wedding ceremony usually takes place in a house of worship, like a church or a temple. The overseers of the ceremonies are typically ordained to officiate the wedding, such as a priest, pastor, deacon, minister, rabbi, etc. 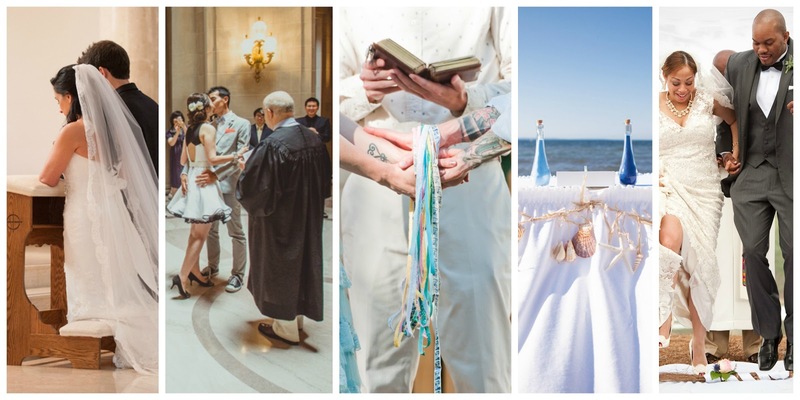 These officiants might also be very closely connected with families and loved ones, so it can also be a very personal, loving experience. If your family has been going to a particular church for decades, that might be the easiest decision to make. Others might be renewing in their faith and are seeking out churches to not only fulfill their marriage, but for their future family as well. So, do also make sure you are a member of your church, and know the rules in how long to be a member before a marriage ceremony can be performed. Although the ceremonies may take place at a church, for example, those same officiators may perform the ceremony at an off-site location. However, when having a truly traditional religious ceremony, a house of worship is the ideal locale as deemed by the church you are desiring to hold your ceremony at. Be sure to check with your house of worship, or officiant, what their rules are. If you find an amazing wedding reception venue that you'd love to have your ceremony at, you must check with the one that will be officiating to see if they will be able to conduct the ceremony there, or at the church, temple, etc. Some church ceremonies can be quick and painless for brides & grooms, and their guests. Some can be quite lengthy. 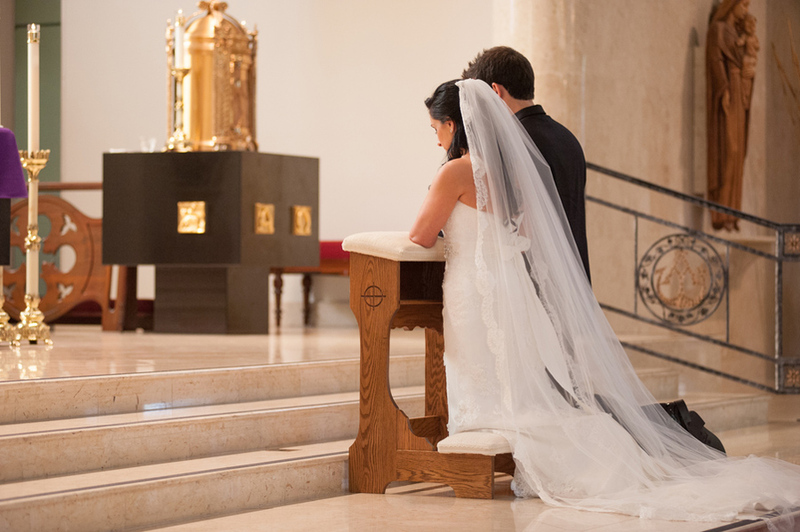 A Catholic wedding ceremony, for example, will include a mass during that ceremony, and that usually lasts an hour at minimum. Some Catholic ceremonies are also conducted in Spanish if the couple marrying is of hispanic origins. Most whom are seeking to marry at their house of worship probably already know what to expect in a wedding ceremony, but others may not, so get all the details before deciding if this is the right choice for you and your spouse-to-be. If you would like all the traditions of a religious ceremony at a venue other than a church, be sure to also inquire the officiant you are seeking that they are fully versed in what you want them to say. Look to resources like WeddingWire.com, where they have a "wedding officiants" page. Type in your zip code, or surrounding area zip codes, or the zip/postal code of a destination wedding, to find the officiants that have great reviews. Remember quality not quantity when looking at review sites. Read the good and the bad, if any. Yes, quantity is ideal as well, but read through as many reviews as possible and see what they are saying. And do try to set up a consultation with the officiant to make sure they are an excellent fit for your ceremony. If there is video footage, all the better. 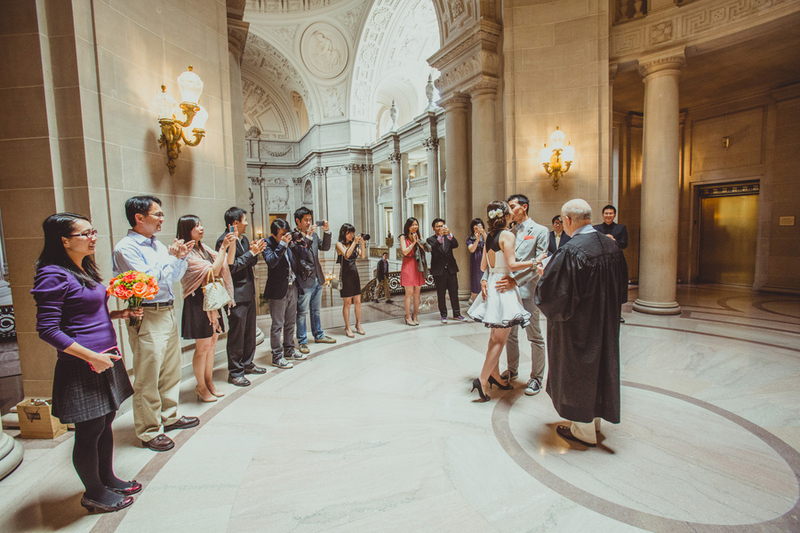 Wedding ceremonies that happen at a city hall are pretty straight forward. Sometimes city hall weddings are intimate, and considered an elopement, other times they are simply simple, with a more elaborate reception to follow. Brides and grooms who are marrying at an international locale might have to opt for the city hall ceremony, as the wedding ceremony at their destination wedding might not be legal once back on home turf...these are things you must read about and learn, if you are wishing to marry overseas! For the city hall ceremony, all you need is you and your spouse-to-be, your marriage license, a Justice of the Peace, and two witnesses-although this can vary state to state, province to province, country to country. For some excellent tips on how to prepare for your city hall wedding, check out this great article here. This custom is steeped in history, and we find it quite unique. In short, a couple will end their ceremony, after they are announced "husband and wife", by jumping over a broom together. Personally, I had always heard of this custom, but hadn't seen it in any of the weddings I've featured in the past 3 years, until a month ago when the couple shown above had this at their beautiful wedding, seen here. There was even an individual in the wedding party that had the job of carrying the broom, much like the average "ring bearer". There are many reasons why couples choose to do this, and what it means in different cultures. We like one of the reasons being that whomever lands first, after the jump, is the household "decision maker"-so ladies be sure to land first! To learn more of the history behind this tradition and other meanings for this to take place, we found an article that explains the facts in great detail here. Unity sand ceremonies are quite popular, as we've seen a few on the blog here, and around the blogosphere. Simply put, the bride and groom will come to a point in their ceremony where they, under the direction of the officiant, will take turns filling a vessel with a different colored sand from the other, signifying the two individuals becoming one. The colors of sand can match the wedding color palette, and is beautiful to see how the colorful sands combine with the other. Usually a couple will place this unity sand vessel somewhere in their home, for them to reflect upon their marriage, and how beautiful a day their wedding was. To learn more about these unity sand ceremonies, we found this great post here that covers the topic with an in depth look on the topic. 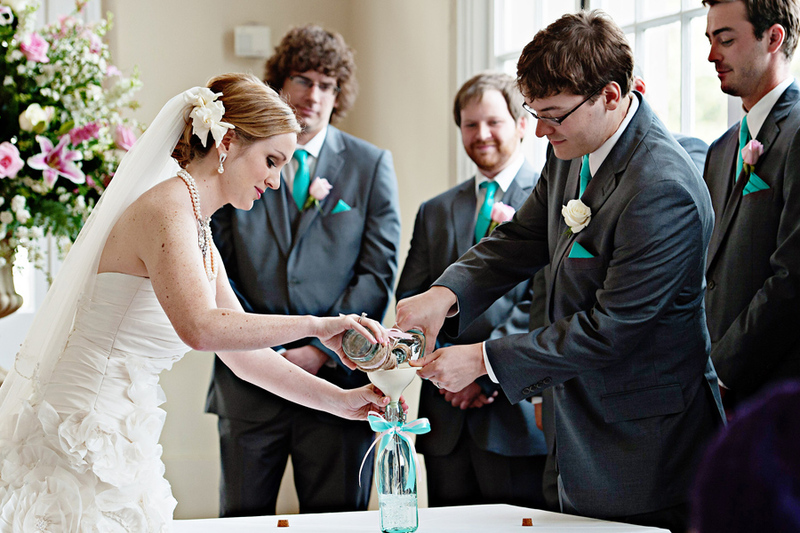 The unity water ceremony is truly something we only just learned about from a wedding we featured just recently, seen here. Per the bride, water was brought from each of their parents’ homes, was combined at the ceremony, where it was blessed, to then be used at the christening of their first child. I really found this tradition touching, and entirely unique. 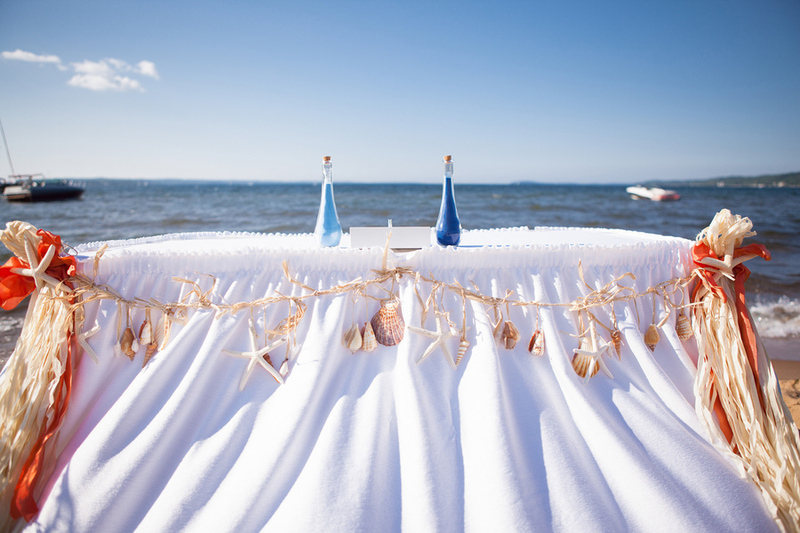 It's definitely an alternative to the sand ceremony, and couples can color the individuals waters to create one color together. We created a board on Pinterest that offers up some unique water ceremony ideas. We've all heard the old saying "tying the knot", when it comes to couples getting married. Where does that saying come from and what does it mean? If you peruse the interwebs, there are tons of articles, and many different meanings. There are many different cultures that have their own spin on this centuries old tradition. The basic concept is that the couple ties two ropes together, during their ceremony, instead of lighting a unity candle, sand or water ceremony. They want to tie this rope so tight so that it does not break, which represents their unity and bonding. But the knots aren't a simple slip knot, like one would do tying shoe laces together. We found one resource here that shows how to tie a proper fisherman's knot, like as shown above. 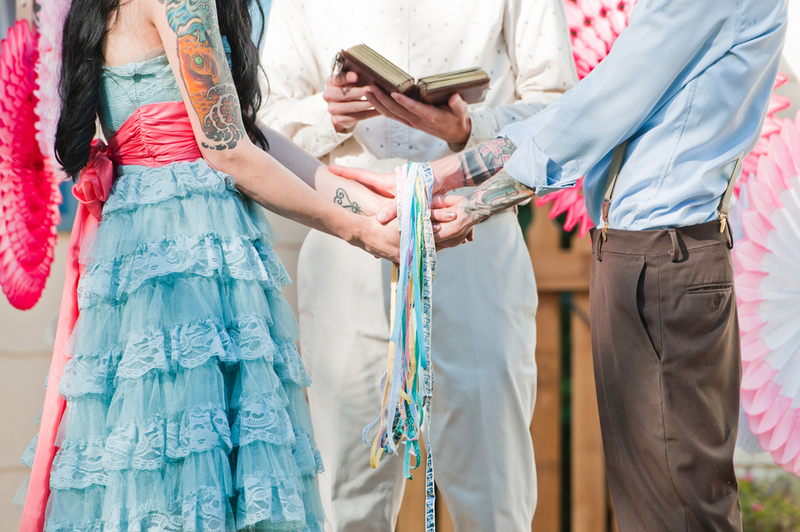 Handfasting is also a form of "tying the knot", however instead of the couple tying ropes together, the couple's hands are bound together with cords and ribbons by loved ones. We found this helpful link here which describes in great detail the origins of this unique and ages old custom. Eco-chic brides & grooms are turning to earth friendly alternatives, such as planting trees during their wedding ceremonies. 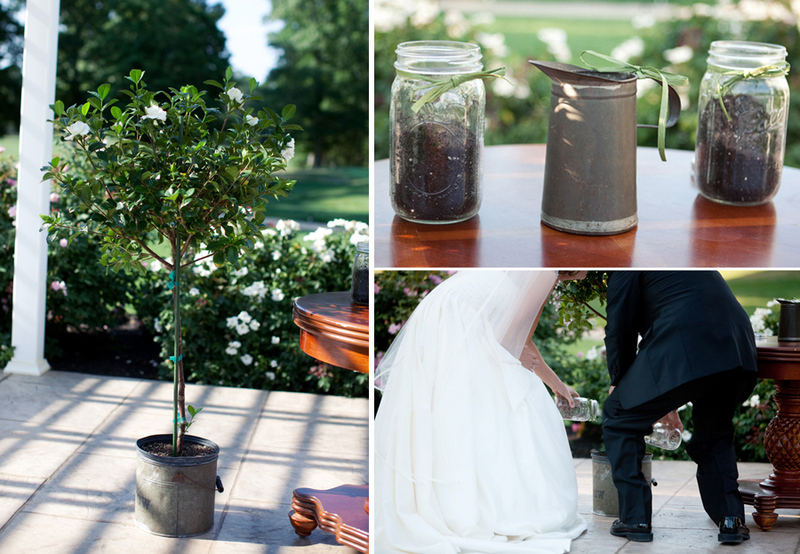 In the image above, the couple added soil to the potted tree, and each sets of parents watered that tree, showing their support in their marriage. We found this article here that not only goes into a bit of history of this custom, but also what sorts of trees couples will select due to a specific significance they carry. Another article, here, also covers quotes and sayings to go along with this ceremony alternative. All I can say about this very unique ceremony alternative is that it was created and designed by the groom. 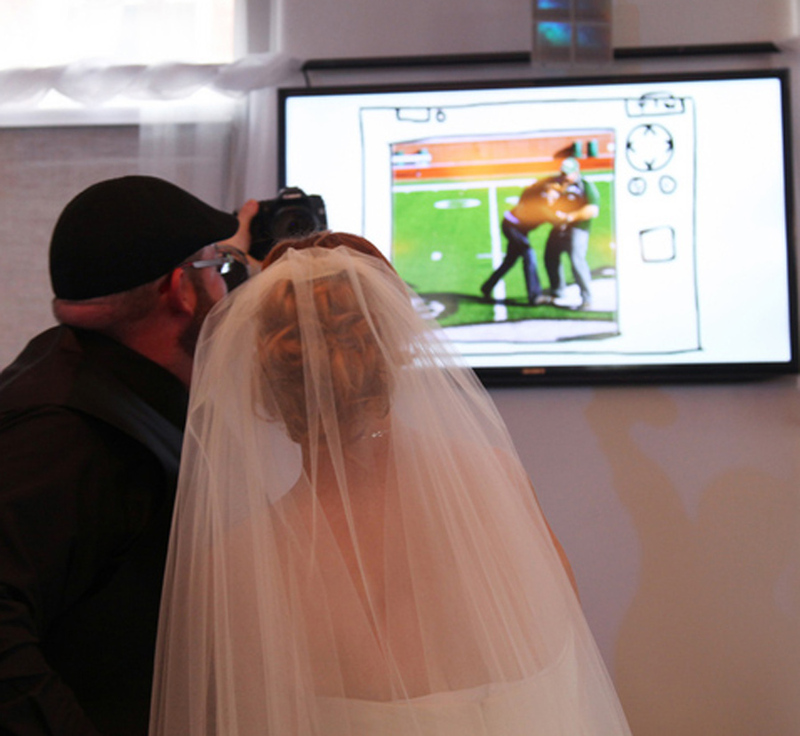 There was an officiant to conduct the ceremony, but the ceremony was mostly led by a video! If you or your spouse-to-be are in the creative video business, this might be an option for you. 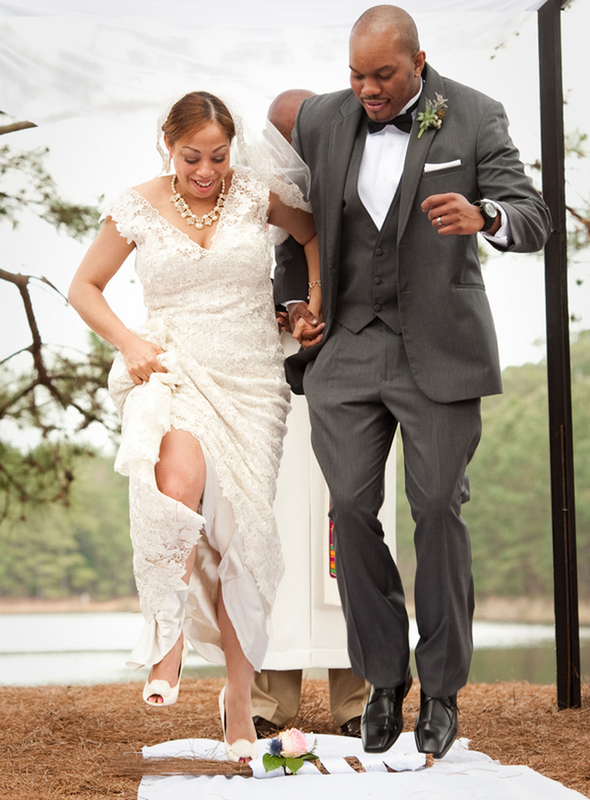 There is no right or wrong way when it comes to wedding ceremonies. You can be as traditional as you want to be, or go the unique route. The most important thing to keep in mind is what you and your spouse-to-be want. Research ideas, consult with officiants, and do enjoy this very special, momentous time in your lives. Which ceremony are you considering to have? Please share with us in the comments section below!